Welcome to my website gallery of fused glass. Prior to gettiing involved in the art of fused glass 4 years ago, my creative focus was centered on home and office decorating and trying to keep up with 5 interesting, dynamic children. I design and create my glass art at the Crucible in Oakland, and at my home studio in Alameda, California. 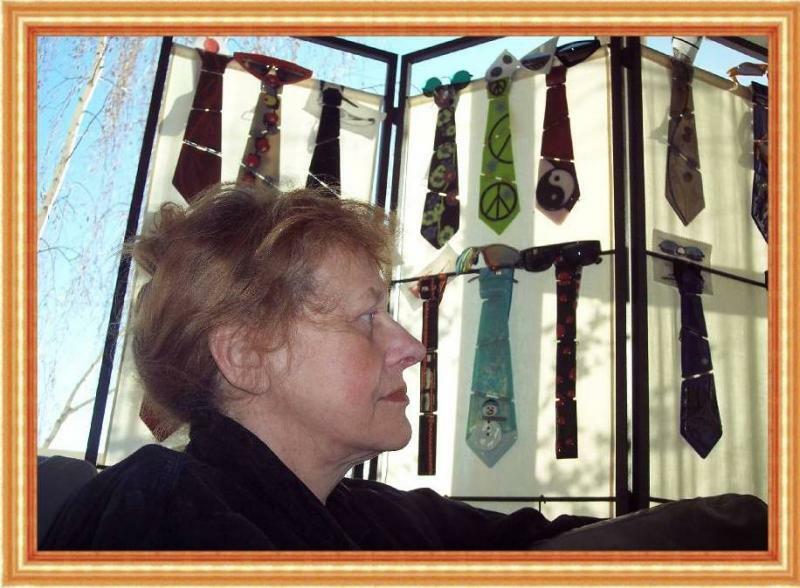 My current project is a series of Glass Neckties. c(g)lassy, but fun, wearable art for men. I see the ties as a playful twist on what is normally considered a conservative fashion. My ties were on the runway at "Hot Couture, a Fusion of Fire and Fashion" at the Crucible, in Oakland, CA. Check out the "Hot Couture" page for pictures of the fun. The collection consists of an expanding series of ties, each of which has a unique theme. With the exception of the "Fire Tie", all of my designs are limited editions of 20.